The recycling trailer is available from the WRRC for any community member or group to book for events. 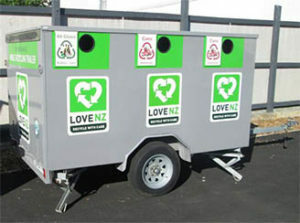 The trailer includes bins and signage and can be customised for the collection of cans, paper, plastic bottles, other plastics and glass bottles as required. There is a $50 deposit payable for the trailer to encourage correct sorting of product at the event. The trailer is a popular way to easily handle waste. Make an enquiry using the Resource Recovery Centre’s booking form if you would like to reserve the trailer for your event.